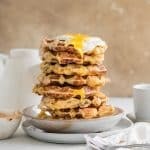 Recipe for Rosemary and Cheddar Buttermilk Waffles, a savory breakfast dish topped with a spicy Remoulade sauce. Servings consist of either 8 small square waffles or 2 large Belgium waffles. 1 1/4 cups vegan mayonnaise. Combine all ingredients into a medium sized bowl. Stir with a wooden spoon until well mixed. Spoon batter into each waffle section ( or 3/4 of entire circle for large single round waffle). Batter will be thick so press down to cover enough surface area for waffle. Close lid and let bake for 7-8 min. max. Combine all ingredients together in a small bowl. Whisk thoroughly to create a pinkish mayo like consistency. Keep leftover waffles in an airtight container in fridge for 2-3 days. Store Remoulade sauce in an airtight container in fridge for 2 weeks.